It’s time for a turkey day bonanza! Yes, I realize that Halloween is coming up this weekend, but honestly it’s never been my thing. So this year I’m just blowing right on by that spooky holiday and today we start chatting it up about all things Thanksgiving. Because oh do I have so very many recipes to share with you before the big day. Brace yourself, because over the next few weeks I have everything from side dishes, to desserts, to appetizers to leftover ideas! Plus, one super fun series that this organizational freak is just so excited to share. But more on that later. For now, we talk these gorgeous homemade spiced sugared cranberries. Not only are they so sparkly and pretty and fun, but completely and utterly addictive. And super easy to pull together. We start by making a simple syrup that is spiced up with all kinds of fall flavors – cinnamon, anise and allspice – for a little bit of pizazz. Fresh cranberries are dunked into the mixture and then removed to a wire rack to dry – so they get nice and sticky (as you can see in that picture right on up above!). Those sticky little red jewels are then rolled around in some granulated sugar and presto, we’re done! Well, they need to dry again but that’s easy and doesn’t require any effort on our part. I don’t use a lot of regular granulated sugar these days, but for this recipe I find it just works best. That pure white color makes these cranberries all kinds of magical. Once the coated cranberries are dry, it’s really up to you how to use them! They are delicious all on their own as a fun appetizer and / or snack. They are outrageously good with crackers and cheese for a super festive holiday cheese board. They make a pretty garnish for desserts. And really whatever else you can dream up! Sweet and tart, plus that sparkle! Gets me every time. 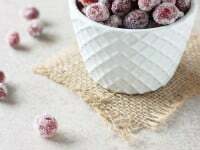 Recipe for homemade spiced sugared cranberries. Sweet, tart and sparkly! Perfect for the holiday season! And so simple to pull together. Add the water, sugar, cinnamon sticks, star anise and allspice to a small saucepan. Set the pan over medium-high heat and cook, stirring frequently, until the sugar has completely dissolved into the water. Let the mixture come just to a boil, then turn down the heat and let simmer gently for 5 minutes. Remove from the heat. Let the mixture cool so that it is lukewarm (and almost at room temperature), then remove the cinnamon sticks, star anise and allspice (and discard). Line a large rimmed baking sheet with aluminum foil and then set a wire rack in the sheet. Add the cranberries directly into the saucepan with the cooled simple syrup (I do this in batches) and stir to coat them well with the syrup. Using a slotted spoon or strainer to shake off the excess syrup, remove the cranberries from the pan and transfer to the prepared wire rack. Spread in an even layer. Let dry for 1 hour before proceeding (this allows the cranberries to get sticky). Add the ¾ cup granulated sugar to a shallow bowl (I like to use a pie dish). Roll the cranberries in batches in the granulated sugar until well coated and then transfer back to the wire rack. Let dry again for about 1 to 2 hours. Most of the prep time is just down time, like waiting for the cranberries to dry. 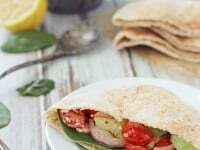 There is not a lot of active time for this recipe! Also, save that simple syrup! It’s fantastic in holiday drinks! Store in the refrigerator. Do you need to cook the cranberries? I didn’t know you could eat cranberries without cooking them first. Hmm. Nope, you don’t need to cook them to eat! Hi, thanks for sharing your recipe. I just made it last night. It was so easy! The best part is eating them but you almost don’t want to since they look so pretty, like jewels! Thanks again. Oh I am so happy to hear this Jessica! Thanks for letting me know! haha I know exactly what you mean! These look so beautiful, my mind is filled with all sorts of ways I can use them. Thanks for sharing! I love how amazing these shimmery cranberries look all coated so beautifully in the spiced syrup and that granulated sugar coating just makes it look like it’s inside snowflakes! I just love it!!! Besides, they’re not just absolutely stunning for Thanksgiving dinner, I will be snacking on them literally everyday! Oh my goodness! These cranberries are GORGEOUS, and I bet they taste as good as they look, too! I love all kinds of cranberries for the Thanksgiving and Christmas seasons, so you KNOW I’m gonna be making these beauties to serve to everyone! How could I not?! Thanks lady!! I’m with you – fresh cranberries this time of the year are just the best! How have I never thought to do this before?? They are absolutely gorgeous and looks delicious! Must try! These are so pretty! They are making me ready for the holidays for sure!! I made sugared cranberries for the first time last year when I made a cranberry cake for my mom’s birthday in December. I love the idea of spicing them up like you did here. They are so pretty! Thanks Amy! Yes! It adds just this little extra warmth or something! I’m not super into Halloween either. I’ve already moved on to Thanksgiving and Christmas…Love how simple these are, the possibilities are endless! This is such a good idea! I have never seen these before…i love how unique this recipe is! They are so perfect for this time of year…i am very exited to try them! Yes! They are so festive for the holidays! Love that these can be made ahead of time and they are just simply gorgeous!! They would also make such a pretty (and inexpensive) decoration for a Thanksgiving table! Love these!! I don’t love Halloween either, but like you, I’m already in full-on Thanksgiving prep mode! And I’m already trying to figure out if one batch of these BEYOND gorgeous cranberries would be enough for my family! 😉 Seriously, they’re stunning Ashley! Woot for Thanksgiving! And thanks Sarah!! These are so festive!! I love what a pretty presentation they make! P.s. I'm skipping Halloween this year too, but I felt guilty so I do have a whopping two Halloween – ish posts. I say bring on the turkey day!! I am totally fine with skipping through Halloween if it were up to me but my chocoholic husband might do a little bit of protesting haha 🙂 I love these sugared cranberries, they’re so gorgeous, Ashley! The star anise in the simple syrup sounds amazing! Halloween is totally not my thing either!! i appreciate the cranberry recipe in October!! LOL These look perfect. I have to admit Halloween has kinda passed me by this year too! I love these sugared cranberries what lovely decorations they will make on desserts and a great way to sweeten up the tart fruits for snacking on. These look so exquisite – I would never have guessed they were this simple to make – and love your use of star anise in the syrup! I used to so look forward to Halloween but I’m just not feeling it this year. I think it makes me miss that my kids aren’t little anymore. So I’m totally OK with skipping forward to Thanksgiving foods. Love these cranberries! They are so pretty! I saw these on instagram and knew that I needed to come by and check out the recipe in-person! Yum!! These look simply adorable. So festive and so delicious. I love this spiced sugar syrup. Love how easy to make these! Makes me think of Christmas.. The color and the sparkle are my favorite part I think! Thanks Marcie! Oh my gosh Ashley these cranberries are exactly my kind of treat! Sweet and sour and finger food — can all my meals be like this? I’m not huge into Halloween either, I welcome all the turkey day recipes! Yes! They remind me in a way of that sour patch kids candy – just like ten thousand times better! These are so festive! A great special touch for Thanksgiving…and I’m glad you’re getting into the Thanksgiving spirit. Halloween is not my thing either, although with a child, I have to muster up some spirit for it. : ) Right after Saturday, it’s full on holiday mode! I can totally see how once we have kids I’ll need to be festive for it!! But for now, Thanksgiving all the way!! haha Thanks Monica! Huge yes to the goat cheese! It’s one of my very favorites to serve these with! Powdered snow beauties, these are so cute! I’ll have to think up how best to incorporate these! Gosh..look at the colour!! I am in love! I love that all the holiday recipes have started on the blogs now, I posted a Christmas one today as it’s never too early. My husband is kind of cranberry obsessed, so I know he would love this. I am totally ready to embrace the holiday season! Thanks Dannii! Thanks Laura! I actually did that last year with these for like hostess gifts – they went over so well with everyone! These are so beautiful Ashley, and I love how festive they look! The spiced syrup sounds delicious too, I am obsessed with cinnamon! This is such an easy and delicious recipe, Ashley! I love it! I’ve heard of sugared cranberries before, but I never realized just how easy it was to throw together. And I love how the combinations for these cuties are just endless. Sounds delish! So simple! Plus, I love that they can be made in advance! Thanks Gayle!